ME. Yes I am the winner of the giveaway from one of my favorite Christian speaker/writer podcasts. I was so excited when I got the notification. I didn’t even know all of what I won except it was a gift pack from the publisher of a guest author on the podcast. 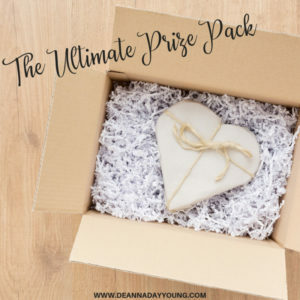 When the gift pack arrived to the speaker to send on to me, the winner, it was a very odd-shaped box and was going to be a “boat load” of money to ship. So my fav speaker personally sent me an email explaining the astronomical cost to ship the prize pack and offered me a few options: 1) She was willing to pay the amount to ship if I wanted; 2) I could have the books from the prize pack along with a very generous amazon gift card; or 3) I could have the books from the prize pack and 1 hour of personal coaching from her. I did not have to think long at all to choose option #3. Books AND an hour of coaching from one of my very favorite speakers!! I was so excited. I was telling a friend about it and she said, “I wonder what all you gave up.” Truthfully, I hadn’t even thought about it. I didn’t really care what I gave up because I was just looking at what I was gaining – an hour of coaching from one of the best. It is the same with salvation. There’s no need to look at what we are giving up in this world because what we are gaining in eternity is worth whatever we have to give up. I hope you have already secured your heavenly prize. If not, ask Jesus to come into your heart and give you the free gift of salvation. I promise you will not even care what is in the worldly prize package you give up because eternity in heaven is the ultimate gift. This entry was posted in devotional, inspirational, motivational, spiritual on September 16, 2018 by Deanna Young. Congratulations! That’s an awesome prize!